1.Put the magnetic plate to the center of mobile phone back( please make sure you put the side printed 'Magnetic plate' to the phone, and the other side with wireless logo to your phone cover), then install mobile phone case. Apply to mobile phone that own with built-in wireless charger such as :SAMSUNG S6, NOKIA 930,LG G2,etc. 2.Provide fixed holder use double-side tap,can remove the protective film of double-side tap from holder base,choose proper place in the car and press tightly. 1. The package does NOT include wireless charging receiver, phone case and power adapter. 2. The phone case should NOT be a metal one or a very thick one. 3. This wireless charger is NOT suitable for iPhone with Non-standard MFI Certified charging receiver or wireless charging case. 4. It is incompatible with Apple watch. 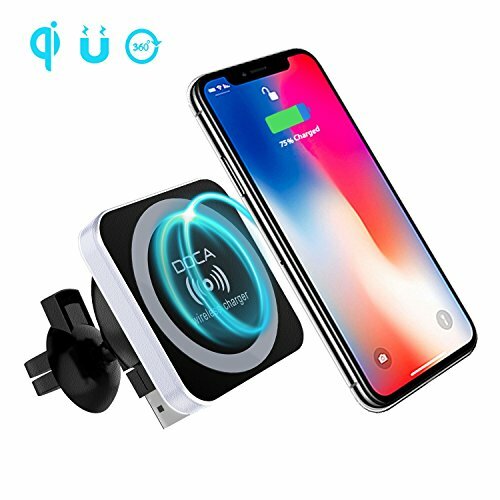 ★ WIRELESS CAR CHARGER - Fast charging for Samsung Galaxy series(Note 8 / S8 / S8 Plus / S7 / S7 Edge / S6 / S6 Edge / S6 Edge plus). Standard Charge for iPhone X/8/8P and other android phones. Some devices may require an additional Qi wireless charging receiver, you can search "B07F2CPPRN" on our shop. ★ TWO HOLDER BASE - Have two different gaps of the holder base fit for air vent or dashboard. The car mount can be rotated 360 degrees and tilted up or down 15 degrees to provide an optimized visual image. ★ WITH RETRACTABLE USB CABLE - Own standard retractable USB cable, insert the original car or USB interface of car charger, press the retractable button to take back the cable after use. ★ HOW TO USE - Stick the magnetic plate to your phone case, then put your phone onto the charger. Please make sure your phone case is thin within 3mm, if your case is metal or thick than 3mm, it won't work. ★ PLEASE NOTE - The phone may appear charging pause or reconnected while driving if your car with 1A or 1.5A , so you need to use more than 2A car charging head for charging. If you have any questions about this product by DOCA, contact us by completing and submitting the form below. If you are looking for a specif part number, please include it with your message.